Measure around your Hip bones across your belly button. 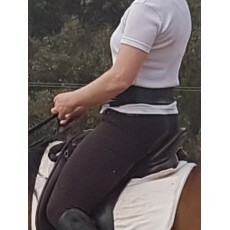 The Applied Posture Riding "Core Sensory Belt". Designed by Annette Willson, Physiotherapist. This belt is only available here on my Applied Posture Riding site. This is a new design specifically for riders to wear while riding and around the stables to increase the sensory awareness of your core and stimulate it into action. The action of the crossover elastic is to follow the Transverse Abdominal Muscle fibers and stimulate and support the action of the core muscle fibers as they contract. The action is similar to rock tape, it will act on the Transverse Abdominal muscle. For riders who have an uncoordinated core muscle. Ideal for new moms who are still trying to "close the gap". Ideal to wear riding to remind you to use your core. Can be worn over your active wear or your jodhpurs. Measure around your Hip bones across your belly button. See video below on how to get the right size.